Riots erupted in Nantes on Saturday, after the French government decided to replace the current airport of Nantes with the bigger 4 million passengers Notre Dame Des Landes Airport, on a new location. Over 20.000 people and 400 tractors held a peaceful demonstration, but a group of around 1000 broke away to fight with riot police. They targeted the town hall, police station and the office of the contractor, with paint and graffiti. The resistance to the new airport dates way back, to 1972, when the project was first proposed as part of an urban/infrastructure development area named Zone d’aménagement différé (ZAD) Opposition stood up against the mega project and took over its name as ZAD-“zone a défendre”. The site is occupied since more than six years – forming what is probably Europe’s largest squat. Residents of the ZAD built their own houses, use collective spaces for baking bread, a pharmacy, sewing, internet and bicycle repair. They show that there is another path for the future, one that respects social and environmental limits. Locals, activists and academics alike are against the plans as it would destroy fifty farms and two natural reserves at a cost of what they claim is close to €4 billion. But the resistance is more than local. In a poll carried out by Ifop, 56 percent of the French are against, while only 24 percent was in favor of the new airport. 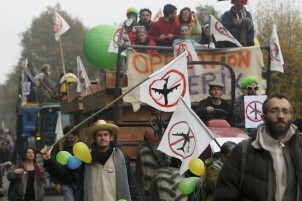 Every year, activists from other countries come to Nantes to demonstrate against the project. It has become a symbolic case for how people in Europe see the future. Apparently, quite a lot of people don’t see a role in the future for an expansion of aviation and fossil fuel use. With the former major of Nantes and a strong supporter of the airport now occupying the post as the French prime minister, this conflict is all set to heat up in the years to come. Since 2007 lots of the opponents have joint together under the «Coordination des associations opposées au projet de nouvel aéroport à Notre-Dame-des-Landes». They are among the most active groups in the European network against the Useless and Imposed Mega Projects. The 4th European Forum against “unnecessary imposed mega projects” will be held from May 8 to May 11 in Rosia Montana, Romania. The conflicts in Rosia Montana, Nantes and many other places are reported in the Ejolt map of environmental conflicts and resistance, which is going to be published in March. Here’s more info on the launch in London and Brussels.